Hot flashes, experienced by large numbers of women and some men as a result of surgical, chemical, or age-induced changes in estrogen levels, are characterized by a rapid rise and discharge of heat with perspiration, discomfort, and possible redness. Ranging from mild to severe in intensity, they may be preceded by an “aura-like” experience, and may be followed by a subsequent feeling of chill. With natural age-related menopause, hot flashes may begin as early as two years prior to the cessation of menses and continue as long as five or more years afterward. Statistically, the average experience is approximately four years of hot flashes of varying intensities. Approximately 20% of women without breast cancer and 50–75% of women taking tamoxifen subsequent to breast cancer will reportedly seek a doctor’s advice for the management of hot flashes. For women without breast cancer, this seems to be a conservative estimate, given that another source notes that as many as 75% of Caucasian women experience perimenopausally related hot flashes, beginning an average of two years prior to the cessation of menstruation. On average, 85% of these women experience hot flashes for more than one year. Statistics are mixed with regard to overall duration. One study reported that only 20% of women reported still having hot flashes after four years, while another reported 25–50% of women continuing to have them as long as five years. Hot flashes appear to be more common amongst African American women than among Caucasian, Japanese, Hispanic, or Chinese women, while Mayan Indian women report no symptoms associated with menopause at all. Hot flashes may be preceded by a prodromal experience, or set of signs, of rapid heart rate, anxiety, and dizziness or weakness. 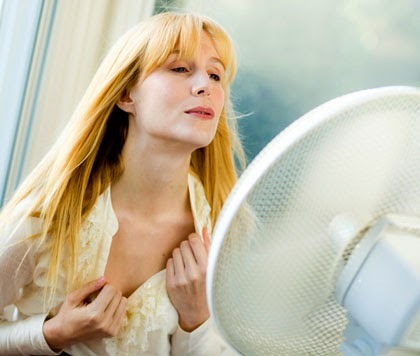 There is considerable variation in the experience of hot flashes. As the flash comes on, there is a feeling of sudden heat that may produce as little as a beading of perspiration on the upper lip, or a sudden and uncontrollable drenching. The sudden feeling of heat may be followed by a cold, clammy sensation as evaporation of perspiration occurs. The episode may last from 30 seconds to five minutes; an average of four minutes is reported. One clinical source reported that patients most commonly describe the onset of hot flashes as coming between two and four in morning, disrupting sleep, often resulting in a need to change nightclothes or even bed linens; but another source noted that the most common time of onset was between six and eight in the morning and six and ten at night. A stressful incident may precede the hot flash, and keeping a journal of these events as a means of identifying triggers may be helpful. Depending on the intensity, severity, and timing, embarrassment may also accompany the hot flash when others witness the sudden, unmistakable signs of the experience. Breast cancer, premature onset of menopause, faster onset of menopause, tamoxifen therapy in women and antiandrogenic therapies in women and men, may contribute to more severe and longer-lasting hot flashes. One source noted that each person individually may themselves experience a wide variation of symptoms, dependent on their unique biochemical, environmental, and psychosocial factors. The exact cause and mechanism of hot flashes is not well understood. What is recognized is that as estrogen levels are depleted, whether due to surgical, chemical, or natural age-related changes, the area in the brain that regulates several functions including body temperature—the hypothalamus—becomes “confused.” The core body temperature set point is lowered, and the threshold between acceptable and nonacceptable body heat levels is more easily crossed. When that occurs, signals are sent to the rest of the body of a sudden need to discharge heat, accomplished through the sudden release of perspiration from the sweat glands. Studies reveal measurable rises in skin temperature. Other hypothalamic signals cause awakenings from sleep, changes in blood pressure and heart rate, and anxiety states (alertness), as if the body is in “fight or flight” mode. In most cases, diagnosis of hot flashes is not difficult. What may be difficult is assessing existing levels of hormones, anticipating the duration of menopause and menopausal symptoms, and finding safe, effective treatment options. Family history, personal medical history, including history of pregnancies and births, a physical examination, such diagnostic assessments as blood workups for thyroid and adrenal (stress coping) function, and hormonal assays (blood or saliva) may be recommended. Bone density testing, and depending on history, more regular mammograms and Pap tests, though not diagnostic of hot flashes, may become advisable. Several alternative treatments are effective. The most widely proclaimed remedies in this category include black cohosh (Cimicifuga racemosa), wild yam (Dioscorea villosa), dong quai (Angelica sinensis), red clover (Trifollium pratense), and licorice (Glycyrrhiza glabra). Also in this category are soy and two soy isoflavones—genistein and daidzein. Of all of these, black cohosh, wild yam, and soy have shown the greatest efficacy. The have also incited controversy. Black cohosh may be the most well-studied of all the phytoestrogens. In North America, Native American women have traditionally used it. The German Commission E, whose stamp of approval makes prescriptive use of black cohosh reimbursable, recommends, according to one source, use for no longer than six months at doses of 20–40 mg daily [of the concentrate]. Apart from safety issues, use of black cohosh by women also taking tamoxifen is not as effective because of competition for estrogen receptor sites. For women not taking tamoxifen simultaneously, the reported improvement over placebo in the use of black cohosh was 25–30%. Given that the placebo effect generates a 30–50% improvement, these statistics may mean as high as a 75–80% reduction with black cohosh. Other combination formulas may include black cohosh in an unconcentrated and unstandardized product, and may be safer for longer periods of time. A study examining the reduction of hot flashes from use of soy flour showed a 40% reduction, 15% greater than placebo. However, considerable controversy about an estrogen-additive effect in women at risk or with a history of breast or uterine cancer, and in men at risk of prostate cancer, warrants caution. One study noted that the soy isoflavones stimulated tumor growth and opposed any beneficial effects tamoxifen might have. Dong quai was reported to be equivalent to placebo with regard to hot flashes, with an advisory caution. Dong quai belongs to a family of herbs that contain warfarin (Coumadin)-like substances, and is therefore contraindicated for use in persons on Coumadin (warfarin) or other blood-thinning therapies. Wild yam and licorice have both been used and recommended for their progesterone-like qualities. Many of the progesterone creams available without prescription have wild yam as a basic source ingredient. Many of these creams also contain pharmaceutical-grade (concentrated and standardized) amounts of progesterone. Without monitoring use by saliva sampling, a worsening of hot flashes may be provoked by progesterone’s estrogen suppressive capacity. Licorice has been historically included in many combination herbals in traditional Chinese medicine as a synergistic (exponentially additive) element; however, caution is advised for persons with high blood pressure. A study of red clover using of 252 women divided into three groups, two each using a separate red clover supplement for 12 weeks and one control group, reported a 40% improvement and no significant side effects. An average of eight hot flash episodes was reduced to an average of five in the two trial groups. When compared with estrogen’s 90% improvement statistic, these results were considered disappointing. TCM divides menopause into “hot” and “cold” menopause on the basis of a thorough history taking and examination of the tongue and pulses (six different pulses). Both acupuncture and Chinese herbology may be employed to reduce stress, facilitate the movement of Chi (or Qi, the body’s internal energy flow), and balance body systems. While some critics claim TCM is no more effective than placebo in controlling hot flashes or the symptoms of menopause, with “few documented benefits,” others point to the survival of this tradition in medicine for thousands of years and believe that something more than a placebo effect is evidenced. Vitamin E therapy is perhaps one of the most historically recommended therapies in North America for hot flashes, in a dosing range from 400–1,000 International Units (IU) daily. Since the 1940s, vitamin E has been believed to be useful in reducing hot flashes and another common symptoms of estrogen deficiency—vaginal dryness. One vitamin company at least, has built a reputation on the clinical benefits of vitamin E therapy. Nevertheless, one source reports on the basis of a “well designed trial” that the success of vitamin E therapy (40%) for the reduction of hot flashes is comparable to placebo (30%). Other studies regarding the antioxidant properties of vitamin E suggest that when the vitamin is combined simultaneously with vitamin C supplementation, a beneficial synergistic antioxidant effect is obtained. A tamoxifen-related trial by the National Cancer Institute recommends use of vitamin E, with C and 200–250 mg of vitamin B6. The entire vitamin B complex might also be recommended for its support of the nervous system and stress reduction. Weight and fitness have been demonstrated to be factors in the management of hot flashes. Weight is recommended to be height-proportionate. Women with less body fat may have as difficult a time as women with too much body fat. Fitness is especially important, and exercise has been demonstrated to improve stamina and attitude, which contribute to tolerance. Nuts, whole grains, apples, celery, alfalfa, and beans have all been recommended as useful dietary adjuncts. One source reports that a general dietary “housecleaning back to basics,” eliminating highly refined and processed foods, including “fast foods” and “junk food,” reducing or eliminating sugar and sugar-substitute products like aspartame, eating more vegetables than fruit, and including in the diet essential fatty acids like flax or fish oils, may go a long way toward stabilizing the nervous system and supporting more normal activity in the hypothalamus. Yes, there really is such a thing. Licensed practitioners and others in the healthcare community have recognized for some time that there is a relationship between high estrogen (estradiol or E2) levels and fibrocystic breast disease, uterine fibroids, endometriosis and fertility dysfunction. Saliva sampling was developed as an alternate means of effectively monitoring not just the levels of circulating hormone, but the amount of biologically active circulating hormone. The pioneer laboratory, DiagnosTechs, Inc. of Kent,Washington, developed a female hormone profile that tracks the interplay of estrogen and progesterone across the span of a menstruating woman’s cycle. They also developed a post menopausal panel to assess the more static balances of women after menstruation ceases, and a testosterone panel for men. Information from these kinds of tests are valuable aids in assessing an individual’s existing hormone values, especially when compared to statistical data of physiologically effective ranges. This information allows for safer, more precise and individual—not one size fits all—use of hormone replacement therapy. A special class of pharmacist, known as a compounding pharmacist, is able to formulate a hormone replacement of “molecularly identical” phytohormones (usually soy and wild yam), standardized to a calculated milligram strength, for use by prescription. These natural estrogen replacements make broadest use of the weakest, most gentle fraction of estrogen, estriol (E3). The other fractions are estradiol (E2)—the most potent—and estrone (E1). Although natural hormones are available in capsules, the most commonly recommended forms are sublingual (under the tongue) drops, or a topical cream or gel, in order to avoid adding further burden to the liver. The liver is responsible for metabolizing the chemistry of the body, and by the time hormone replacement therapy is usually needed, the liver has been hard at work for many years. Drops and creams also allow for individual tailoring. Natural hormone replacement therapy, however, must be used with the same caution as pharmaceutical synthetics, even though its compounds may be safer and reduce the health risks that have become associated with synthetic hormone replacement therapy or no treatment at all. Without clinical trials, statistical proof and good data remain unavailable. Because the liver is the primary organ for metabolizing hormones, therapies that include a liver support or detoxification may assist in the smooth transitioning through menopause. This might be especially important in persons whose hot flashes are surgically or chemically induced, as the need for both of these kinds of interventions was likely preceded by hormone related illness. Colon cleansing and increased intake of dietary and soluble fibers may also be recommended. Sources of dietary and soluble fiber include whole grains and grain brans, most vegetables, many fruits and fruit pectin, psyllium, and guar gum. Mares were kept pregnant, catheterized for urine collection, and dehydrated for more concentrated urine. That fact alone was enough to dissuade some women from using it. However, no other single remedy had been shown to have the efficacy (96%)of reducing or eliminating hot flashes like estrogen (as Premarin) hormone replacement therapy. Mares have similar but unidentical estrogens compared to humans. One of the substances specific to mares estrogen is genetically toxic to humans. Furthermore, in the normal female’s physiology, estrogen is opposed by progesterone, another female reproductive hormone. Supplementing estrogen by using Premarin, unopposed by progesterone, resulted frequently in a condition known as hyperestrogenism and increased risks and rates of breast and uterine cancer. Ignoring a possible genetic toxicity of premarin, subsequent prescriptions for hormone replacement therapy concentrated on opposing premarin’s estrogen in a combination patented hormone drug called Prempro. In the summer of 2002, results of the Women’s Health Initiative study were released, statistically demonstrating the increased health risks (breast cancer, stroke and heart attack) of these modalities. Along with results of other studies suggesting that estrogen replacement therapy was also not as protective against osteoporosis as had once been believed, serious reconsideration of hot flashes management was prompted. The current trend in synthetic hot flashes management and hormone replacement therapy is a multifaceted approach which may include the short-term use of estrogen. Several the other synthetic options are discussed below. Depomedroxyprogesterone acetate (MPA) has been reviewed and found, at doses of 150 mg every one to two months [as an injection], for women with endometrial cancer to be 85% effective in reducing hot flashes when compared with estrogen. Oral doses of 10 mg/day were 87% effective. Reported side effects included: irregular vaginal bleeding, weight gain and bloating, breast tenderness and mood swings. Blood pressure medications—alpha-adrenergic agonist antihypertensives—that inhibit the stress trigger pathways involved in hot flashes, reduce hot flashes 20% to 65%. Drugs and dosages used include: clonidine, at 0.05–0.2 mg/day; lefoxidine, at 0.1 mg/day; and methyldopa, at 250 mg three times daily. Side effects of dizziness and dry mouth were reported. The twice daily use of 40 mg of bellergal—a potent hypnotic-sedative combination of ergotamine tartrate, belladona alkaloids, and phenobarbitol— reduces hot flashes by 60% when compared to the placebo rate of 22%. This drug is one of the older synthetic remedies prescribed for hot flashes, due to its effects on the nervous system. It has the very undesirable effect of being addictive, and avoidance of alcohol is strongly advised. One of the newer drugs for relief of hot flashes, studied under rigorous clinical trial according to one source, a 20 mg twice daily oral dose, megestrol acetate is considered to show high promise for use in both men and women. It is considered as a treatment for breast cancer in high continuous doses. Initial dosing is reported to start at 40 mg daily, and then be tapered up or down after a month, to a maximum of 80 mg daily. Side effects noted were fluid retention and bloating. New attention is being paid to this class of drugs, especially to Prozac (fluoxetine), Paxil (paroxetine), and Effexor (venlafaxine). Venlafaxine is sometimes also notated as an ‘NSRI’ or a norepinephrine serotonin reuptake inhibitor. Norepinephrine is an adrenal hormone related to feelings of ambition and depression. By relieving deficits that may affect mood and hot flashes, these reuptake inhibitors are showing a 50% to 75% efficacy in decreasing hot flashes in 60% of women, making them better than trial placebo (22% to 30%) by about half. Eighty per cent of the benefit was achieved in the first week. The noted dose on Paxil is 10 mg. daily for the first week, followed by 20 mg daily thereafter. Dosing for Effexor was noted at 75 mg twice daily of a time released formula. The study using 75 mg followed studies using considerably less, 12.5 mg twice daily. Side effects include sexual dysfunction, and, according to one source, possible weight gain from increased carbohydrate craving. Though some hot flashes for some women may be severe, occur over several years, be embarrassing, disruptive, mood-altering, fatigue-inducing, and correlated with other age-related deficiencies sufficient to make a grown person cry, they are not life-threatening. The statistics, according to one source, that “in virtually all reported studies, hot flashes respond to placebo in 30% to 50% of women,” may mean that an average 40% reduction in hot flashes may be obtained by visiting a health care professional, allopathic or alternative, talking about concerns, and instituting lifestyle changes representing a kind of pampering or self-care. In other words, hot flash sufferers may feel statistically justified in adopting new ways of living they might have been contemplating previously but have not yet adopted. Saliva sampling: Consider working with a healthcare professional who can offer advice and hormone testing of the bio-available levels through saliva sampling, and who may also be able to quantitatively advise and monitor natural hormone replacement therapy. A postmenopausal saliva panel costs between $85 and $100, and may be covered by insurance. Sampling intervals may vary according to need. Obtaining and maintaining optimum body weight: Adipose (fat) tissue stores estrogen, which may complicate safe hormone replacement therapy, while making heat distribution more difficult. A deficiency of adipose tissue may add to stress and lower immunity. Exercising regularly: Exercise not only tones the muscles and improves distribution of all hormones, it also reduces stress, builds endorphins (hormones related to feeling well), and quiets the nervous system. Avoiding dietary triggers: Sugar, spicy foods, caffeine and alcohol may all adversely affect the ability of the hypothalamus to regulates body temperature. Avoiding life style triggers: Diet pills, saunas, hot tubs, hot showers, and smoking are all to be avoided. Wearing layered cotton clothing and using cotton bed linens: Breathable natural fibers or sport fibers that wick away perspiration may help transfer heat; layering more easily allows quicker responses to heating and chilling. Meditating and breathing deeply: Also included in this category are yoga, hypnosis, massage, biofeedback techniques, visualization, and relaxation exercises. These techniques reduce stress and oppose or quiet the nerve pathways involved in increased triggering of hot flashes. Air conditioning: One source suggested liberal use of the air conditioner and even the freezer (at home and supermarket) when a hot flash happens; turning down the thermostat of the furnace in winter as low as possible was also suggested.